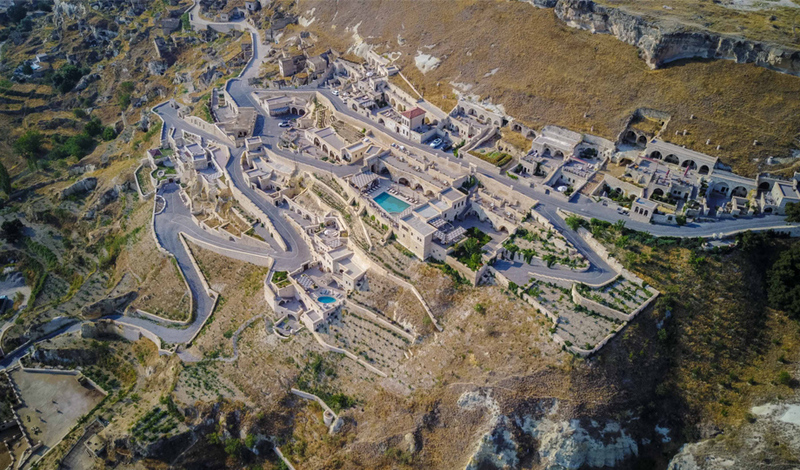 As being one of the first settlement zones in Cappadocia’s centrally located City of Ürgüp, the historical site of Kayakapi Neighborhood – which is also known as the “Landowners’ Neighborhood” is returning back to its glory days under the name of Kayakapi Premium Caves – Cappadocia, supported by UNESCO and World Heritage Center is formed by hundreds of cave houses and historical structures. 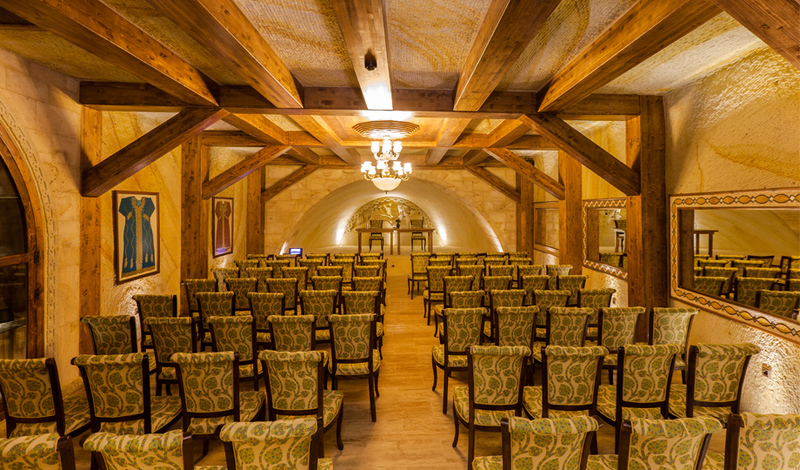 You can be one of the special guests of this historical neighborhood with its 10th Century Cave Church, the Historical Mosque dated back to Seljuq Empire and the House of St. John the Russian with it’s unique Ürgüp / Cappadocia view. The Cave Rooms, Suites and Mansions (by March 2018 – 43 units) with the sizes varying from 33 m2 and 253 m2, which are designed for your daily needs and luxury holidays are waiting for their new owners. iPod – iPhone Docking Stations (for iPhone 5 and above – if you have Android Phone please ask Reception for Android Docking Station), High Speed Wireless Internet Connection, O’live by Kayakapi Guest Amenities, Bulgari Bathroom Amenities (in some categories), HD LED TV with Satellite Broadcasting etc. (for more detailed information please check the properties of your room/suite). 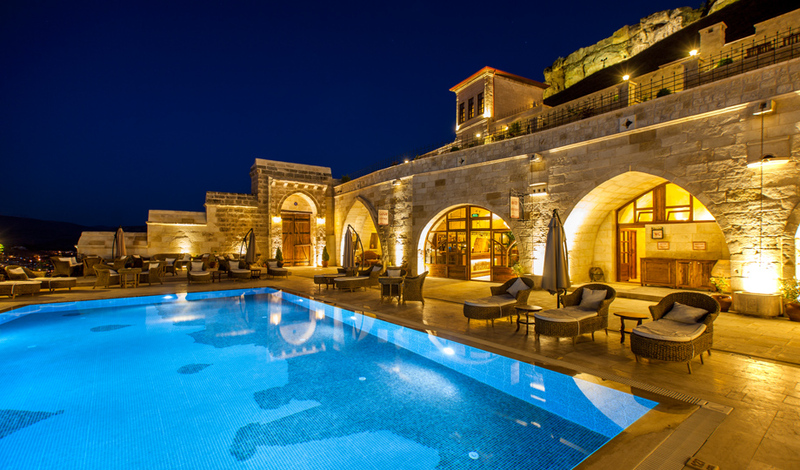 It is located at Davut Agha Mansion, at the lower level just next to the Swimming Pool. 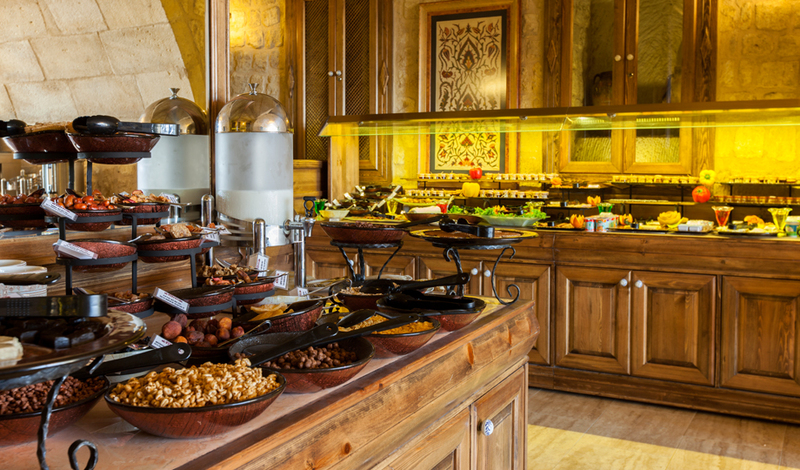 It is our Main Restaurant also hosting a Very Rich Breakfast Buffet including Cappadocian & International Specialties between 07:00 – 10:00 every day. 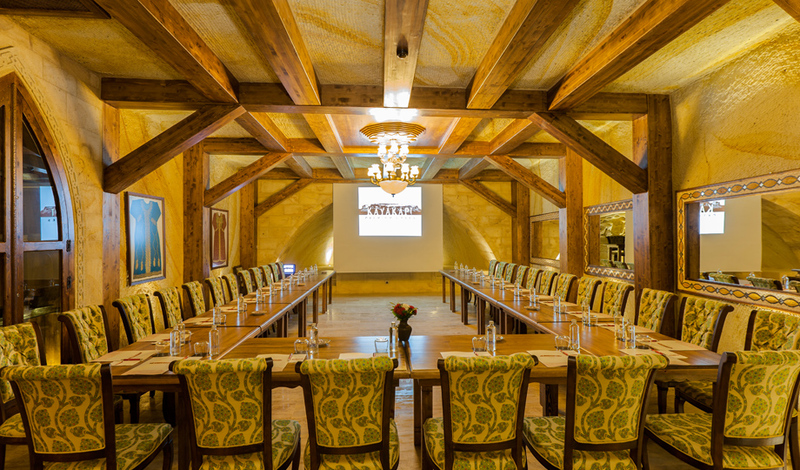 Between 10:00 – 22:00 it acts as “à la Carte Restaurant” serving International and Local Specialties. 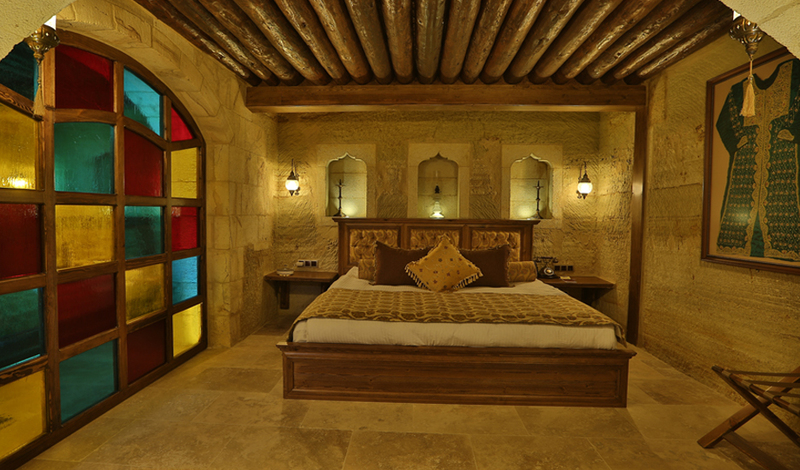 It is located at the upper level in between the suites 106 – Arabaci Köylü Mehmet Evi and 107 – Kunduraci Fehmi Evi. It is open between 12:00 – 21:00 every day and acts as Snack Restaurant serving only Snacks together with a wide range of beverage selection. 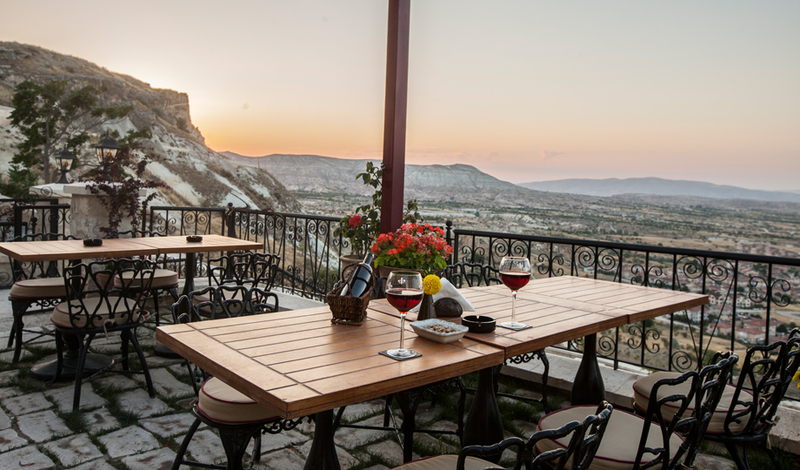 Throughout the summer and good weathers, Terrace of Bistro Manzara is very cozy with a spectacular view of Ürgüp. 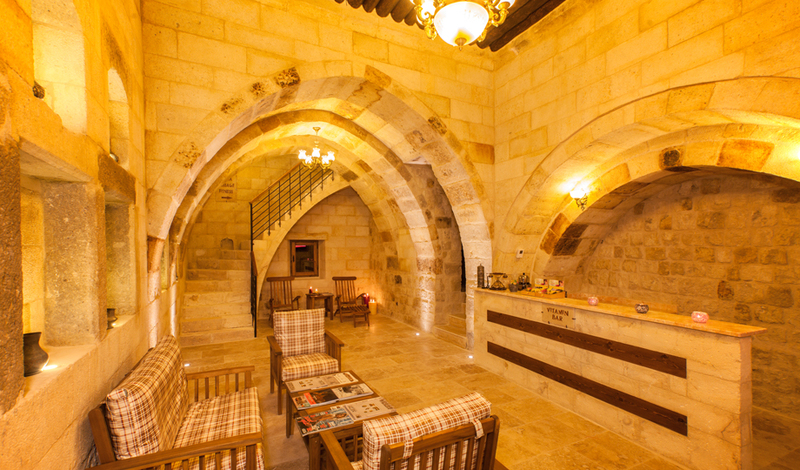 It is located at Davut Agha Mansion very close to Maide Restaurant. 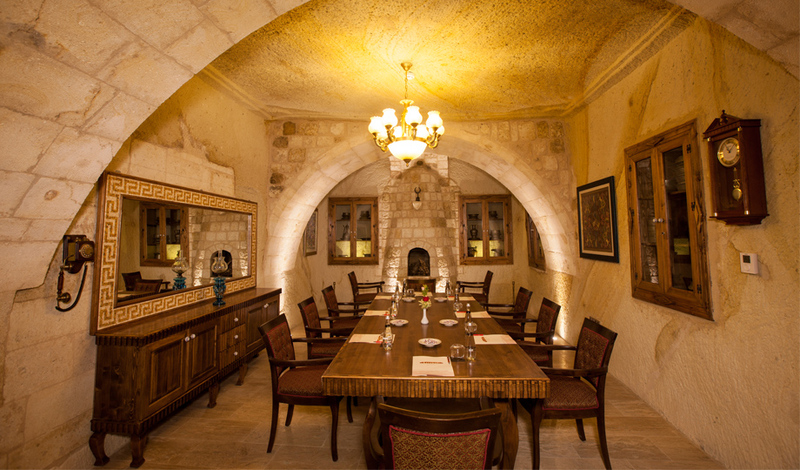 At our very special Wine Cellar we only offer high quality Wine from Cappadocia. 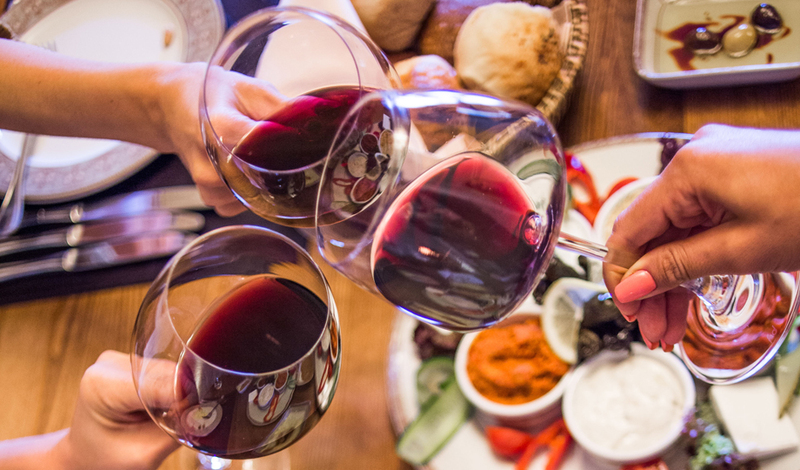 A bottle of Cappadocia Wine together with local and international cheese plate is highly recommended. It will open its door upon your request. We offer 24 hour Room Service for the comfort of our guests. Unfortunately orders made after 23:00 the menu alternatives are a little bit more limited. 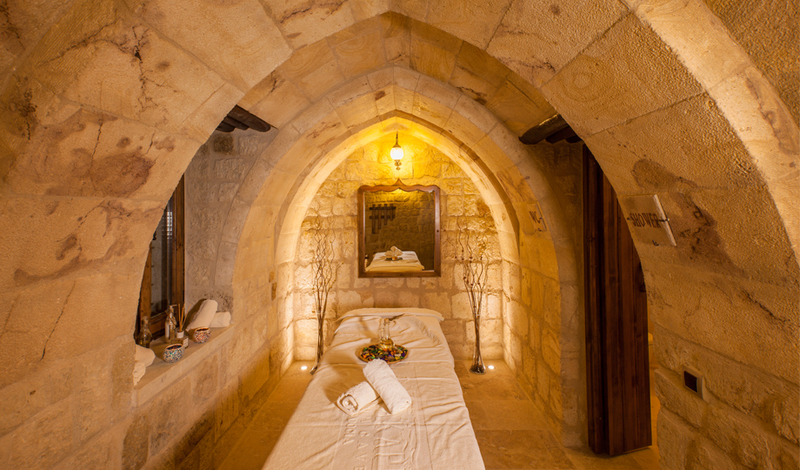 Kayakapi Spa is located at the Historical Davut Agha Mansion just next to the Swimming Pool and Maide Restaurant on the lower end of Kayakapi Premium Caves – Cappadocia. 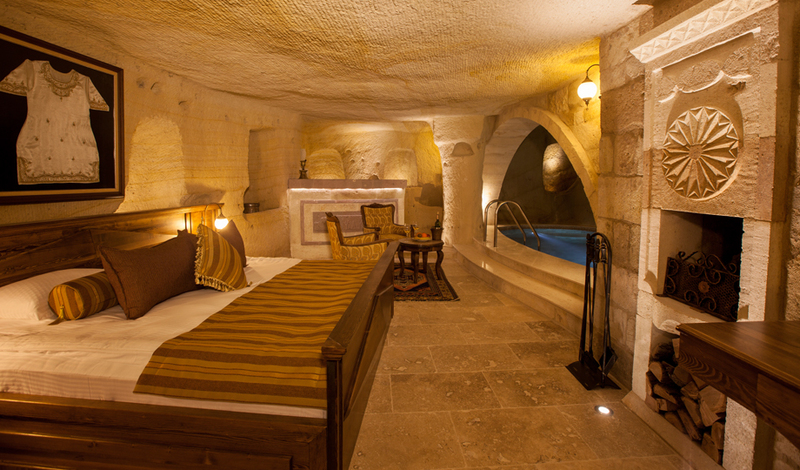 It is open Daily from 14:00 to 23:00 and the entrance to the Spa is Free of Charge for all Kayakapi Premium Caves – Cappadocia guests, only massages are due to a fee. 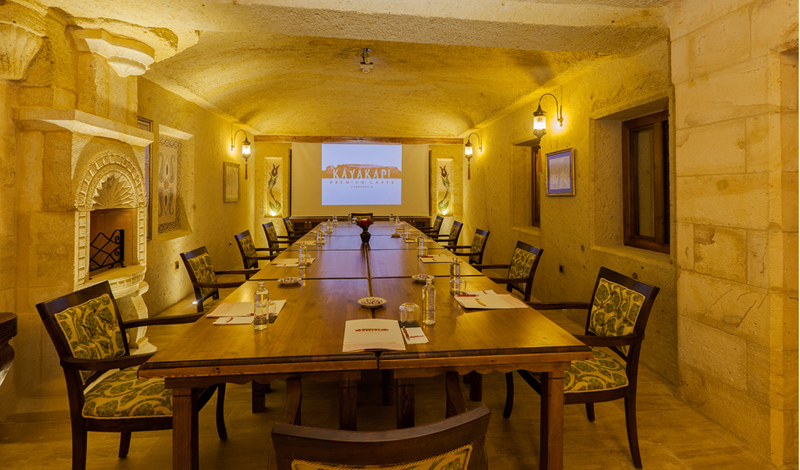 Kayakapi Premium Caves – Cappadocia offers a total of 4 meeting halls with open air and closed foyers for your business needs. These halls and rooms have sizes of 94 m2, 42 m2, 35 m2 and 20 m2 with all technological amenities necessary for a successful event. 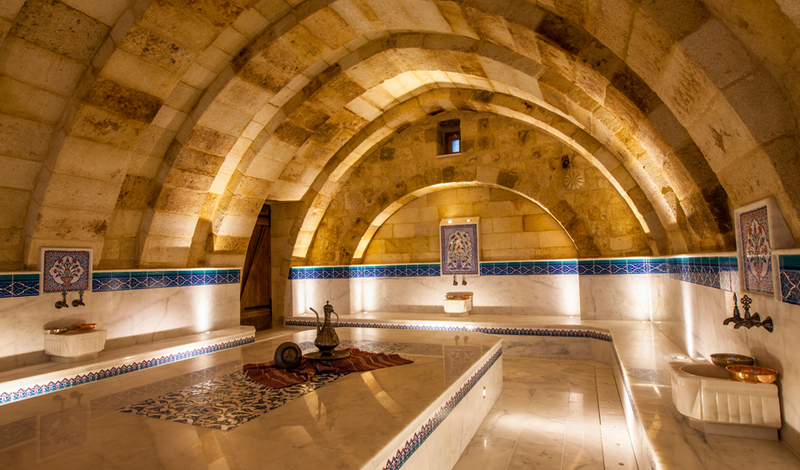 It is located at Davut Agha Mansion. With its spectacular view of Ürgüp it is the most popular area of Kayakapi during summer time (end of May – beginning of September). The total area of the Swimming Pool is 90m2 including the children section. The children section’s depth is 40cm and the pool’s depth is between from lowest 127cm to 143cm the highest level. 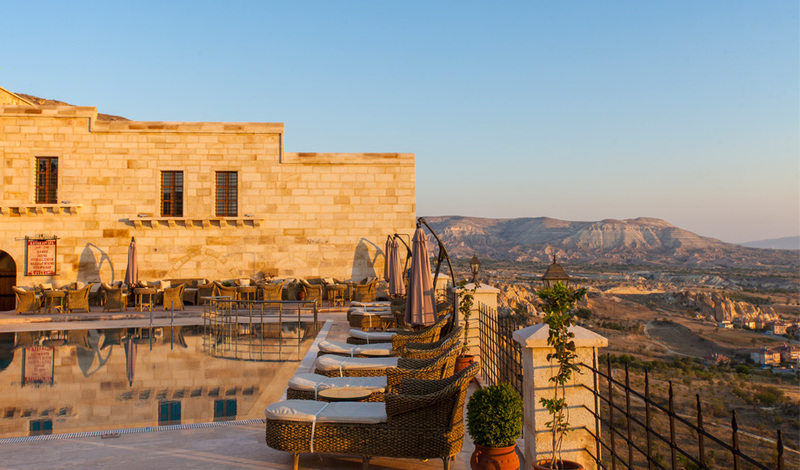 The pool itself is made from Glass Mosaic Tiles hosting a wonderful panoramic view of Kayakapi, Cappadocia and Hot Air Balloons. 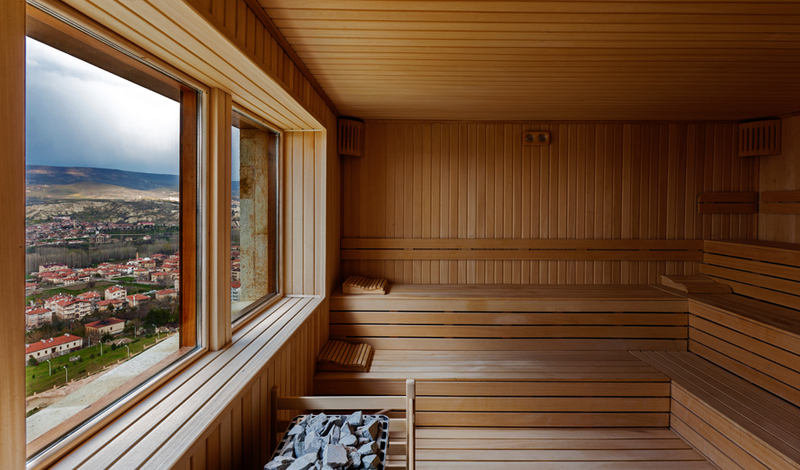 The pool can be used between 10:00 – 19:00 as long as the weather permits. 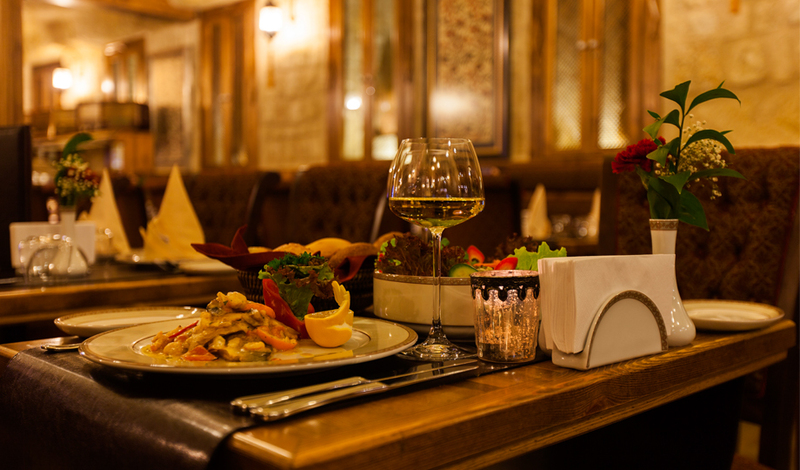 Just like Maide Restaurant and Şekerci Wine Cellar it is located at Davut Agha Mansion. 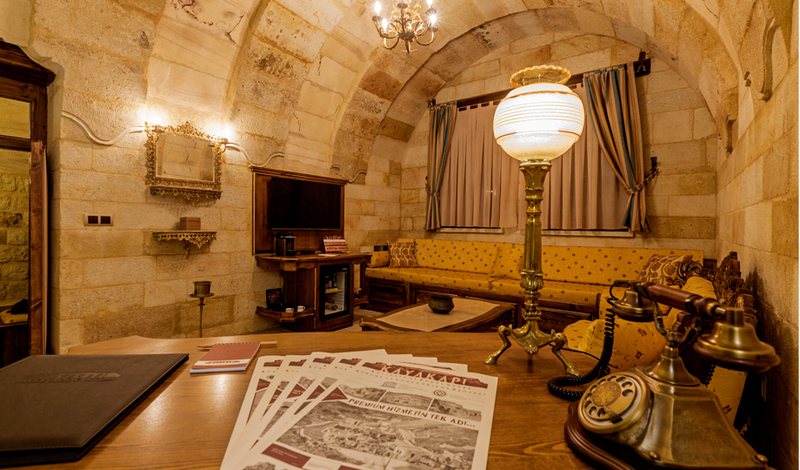 If you would like to read daily newspapers and monthly international magazines in comfortable antique Turkish chairs you are at the right place. We also have TV and 2 PC’s with Internet Connection together with Printers if you would like to surf on the net or print out documents. The neighborhood where Kayakapi makes its home, high in the hills of Ürgüp which is the most lively city of Cappadocia, has long been considered a privileged place to lay one’s head. 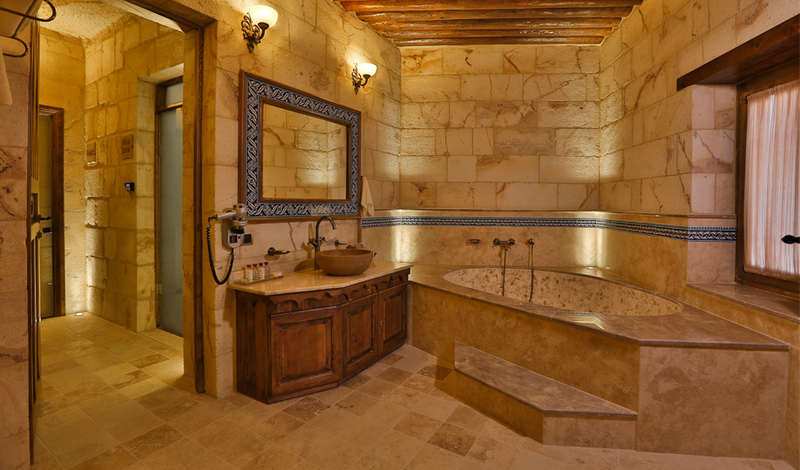 Ürgüp, is within the boundaries of “Göreme National Park and the Cappadocia Rocky Areas”. 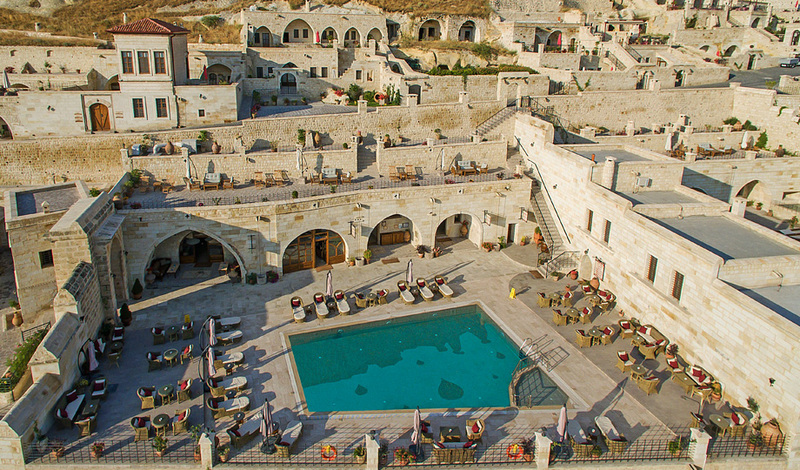 The historical and natural attractions such as Göreme Open Air Museum, Uçhisar Castle and Love Valley are approximately 10 – 15 minutes by driving to the hotel. Nevşehir Airport (NAV) is 48km and Kayseri Airport (ASR) is 75km away from the hotel.